Full size Elephant- WED or Oil clay? 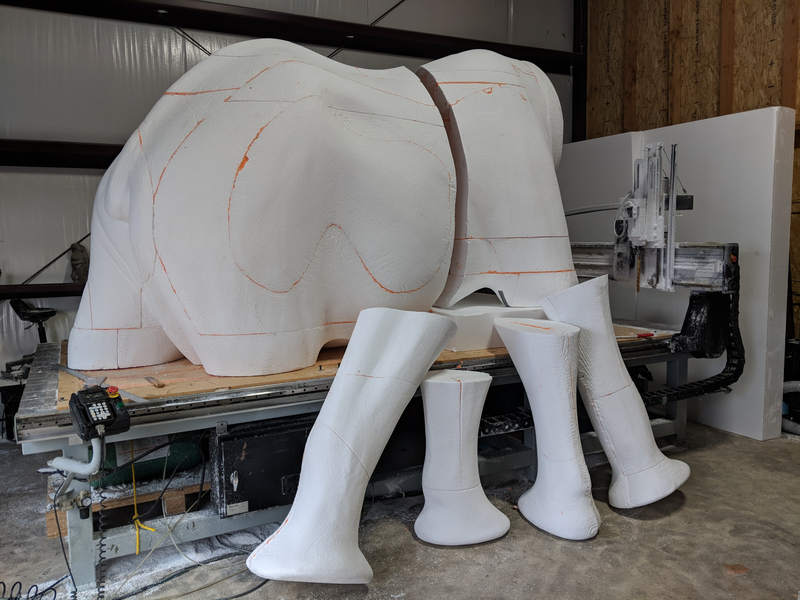 We are sculpting a full size elephant and need to create a very high level of realistic skin detail. The sculpture will be sculpted then cast with rubber. We created and EPS foam base armature and will be covering it with .5 - 1" thickness of clay. We like the speed of WED clay by are afraid of short work time and cracking. Anyone done this before? Any recommendations WED vs Oil clay for this application? Is it possible to keep the clay moist on this scale? I would go with oil clay over WED for this. The thinner WED clay is, the faster it will dry. As you are doing a thin skin over the foam base it may dry, crack, fall off on you pretty easily. I'm sure it's possible to keep it wet enough that it does not crack too badly if you have around the clock supervision, and are careful to not get it so wet that it slumps off. You will also want to have something on the outside of the foam for your clay to grab on to (like chicken wire) otherwise the weight of the clay could make it fall off. Areas like the belly will be the most likely to fall off. I love seeing projects this size and hope you can continue to share your progress with us. Very challenging work! Thanks for your reply, We plan to prime the EPS foam, Do you think the oil clay would fall off or just the WED clay?